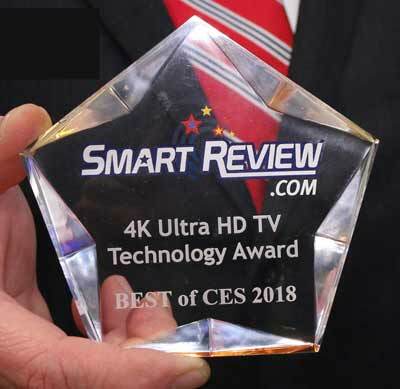 SmartReview.com distributed its “Best of CES 2019” Awards to those exceptional products that utilize 4K Ultra HD technology. This includes camcorders, cameras, and TVs. 4K Ultra HD is the latest video and screen technology, and is quickly overtaking Full HD as the preferred video technology. This is similar to the transition from SD (standard definition) to HD. Most movie theaters, worldwide are now are using Sony’s 4K digital projection system. The advantages of 4K are many, especially for filmmakers, and those shooting 4K Video with cameras or camcorders. The Consumer Electronics Show (CES 2019) was held in Las Vegas on January 8-11, 2019. What is 4K and why is it important: 4K Ultra HD is the next evolution of screen and video technology. The current Full HD 1080p technology that we have been using for over a decade is now being replaced by 4K. The resolution of 4K is 4 times better than HD (8 million pixels vs. 2 million pixels). This will allow those with even small 4K cameras to have a resolution close to what the movie theaters 4K projectors have. 4K allows larger TVs which keep the picture crisp and clear, even when sitting closeup. For filmmakers you can shoot in 4K, and then downgrade to HD, and still retain much of the improved clarity. Or you can zoom in on portions of the video while still retaining full HD quality. Close behind 4K is the upcoming 8K standard which we will cover as it gets more mainstream. Movie Theater 4K Projectors – Without knowing it, we all have been watching 4K at the movie theater. 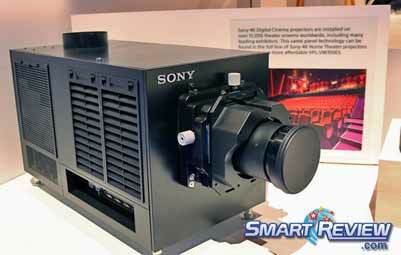 The 4K projector pictured above is an actual Sony 4K projector that was on display at CES. Sony has over 15,000 4K projectors in theaters worldwide and has a decade of experience in 4K. Your 4K TV will give you movie theater resolution at home. 4K TVs have this advanced technology built into them. 4K resolution for movie theaters is slightly wider, at (DCI 4096 x 2160) and has slightly more resolution than 4K TVs for home (UHD 3840 x 2160). 8K projectors will eventually replace 4K projectors, but this is many years out. 2019 4K Action Cam: The GoPro Hero 7 Black has won our 4K technology award and Best of CES 2019. 4k video recording up to 60/frames second. The brand new improved Hypersmooth image stabilization will stabilize the 4K video at all frame rates. This was very impressive, when compared to other models, and the best new feature. New, smooth time lapse feature called Time Warp was added. This is the first GoPro with live streaming to social media, such as Facebook. 2019 4K Camcorder: The winner is the Canon G50 4k camcorder. This model will replace the G40 HD only camcorder. The G50 will be Canon’s least expensive 4k camcorder. The Vixia G50 features 4K at 24,30 fps, Dual SD card slots, a lens hood, 3-inch touchscreen, and 5-axis image stabilization. 2019 4K Mirrorless Cameras: Both Nikon and Panasonic have won our Best of CES 2019 awards. 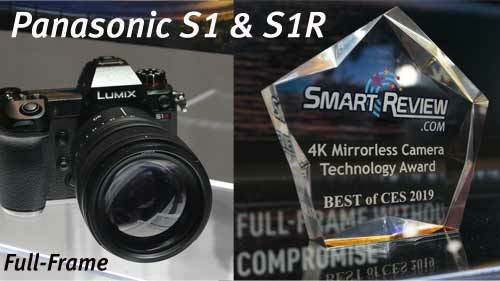 Panasonic introduces its new S1 and S1R Full frame mirrorless cameras. Both can shoot 4k at 60p, both have a new l-mount system, and the highly rated dual image stabilization (using lens & sensor). The S1 has a 24 megapixel sensor, while the S1R has a 47 megapixel sensor. Panasonic is also releasing 3 new lenses for these cameras. 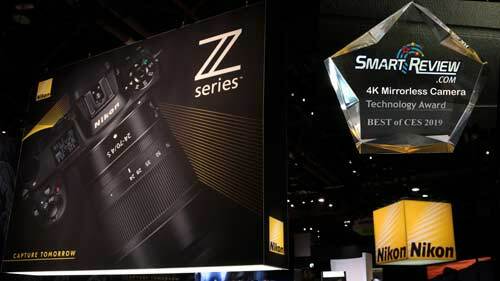 Nikon Z-Series 4K: Nikon has introduced its Z-Series 4K mirrorless cameras, the Z6 (24.5 MP) and Z7 (45.7 MP). Both are capable of shooting 4K at up to 30p, and both have in-body 5-axis VR image stabilization. There is zero crop factor when shooting in 4K. Can shoot 4K in the FX or DX format. Smooth, quiet AF in video mode. New NLOG with up to 12 stops of dynamic range. New 10 bit HDMI output to an external recorder such as an Atomos Ninja 5. 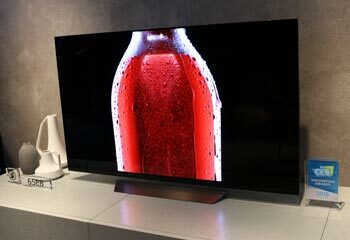 2019 4K Ultra HD TV: The winner this year is LG’s new roll up 4K OLED TV. The LG Signature OLED TV R rolls up into its base when not in use. This was one of the most popular new products at CES and created quite a stir. The base is very attractive, where you could put it in a room you normally would not have a TV. This model will go on sale sometime in 2019. This model uses the Alpha 9 processing chip used in other high end LG 2019 TVs. A built-in soundbar can play music even when the TV is stowed away. 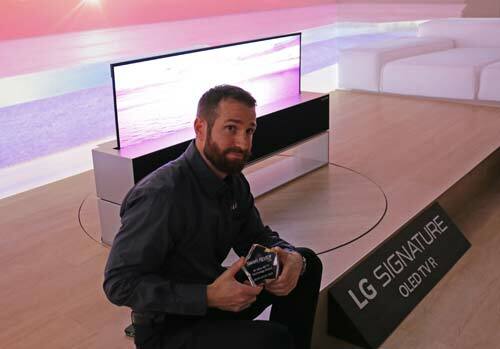 4K Ultra HD TV Technology Award: This award was presented to LG at CES 2018 for their OLED 4K TV technology. Every CES LG has dazzled us by their OLED screens. 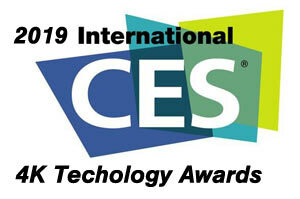 Shortly after we presented the award, the lights went out (CES blackout) adding some drama to the electronics show. LG at CES has introduced its new crop of OLED TVs, with a new A9 processor for even better quality pictures. The C8, E8 and W8 have the new A9 Alpha processor, and support new High Frame Rate (HFR) 120 frame rate technology. There is also a new B series, B8, the lowest priced OLED with lower specs. For High Dynamic Range, LG has 4K active HDR, and 4K cinema HDR. 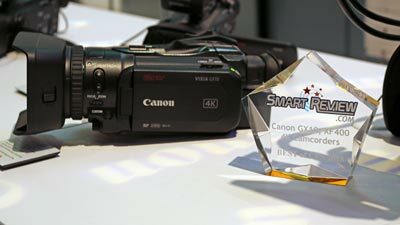 4K Camcorder Award: This award was presented to Canon at CES 2018 for their 3 new 4K camcorders, the Consumer GX10 4K Camcorder, and the XF400 & XF405 Professional 4K Camcorders with XLR sound. 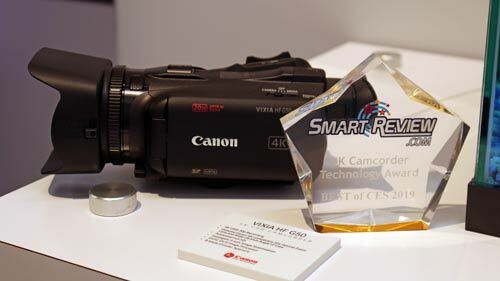 The camcorders have some high end features, such as 60p in 4K, Dual Pixel CMOS AF focusing, and 5 Axis Image stabilization. The Vixia GX10 is Canon’s first consumer 4K camcorder, and first with Dual Pixel CMOS AF. We believe that Dual Pixel CMOS AF which is in Canon’s DSLR line, is the best autofocusing technology for video. We used it in our Canon 70D DSLR for dependable focusing of CES 2018 for video. 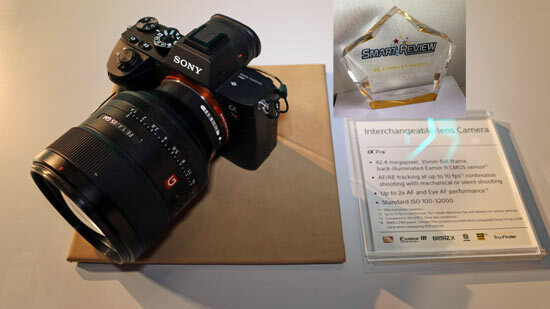 4K Camera Award: This award was presented to Sony at CES 2018 for their Sony a7Riii model for photo centric users, The A7R Mark III not only shoots beautiful 4K Ultra HD footage, but is a great still camera, with 42.4 Megapixels, 10 frames/second continuous shooting, and a great Autofocus system. The second winner was awarded to the Panasonic GH5s for video centric users, and this model has the highest ISO of any micro 4/3rds camera on the market, made for low light performance.